This Mario papercraft is Yoshi's Egg, from the video game Super Smash Bros. series, the paper craft was created by joão Vieira. 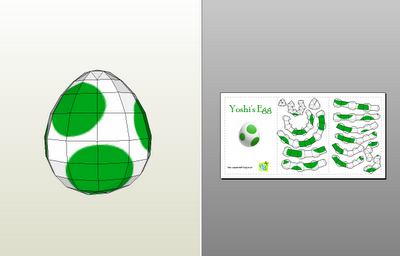 In most games featuring Yoshis, Yoshi Eggs are involved. Yoshis are known for being capable of laying eggs at will. They usually contain a Baby Yoshi or an item inside. The Yoshi Egg is also Yoshi's signature emblem in various games.